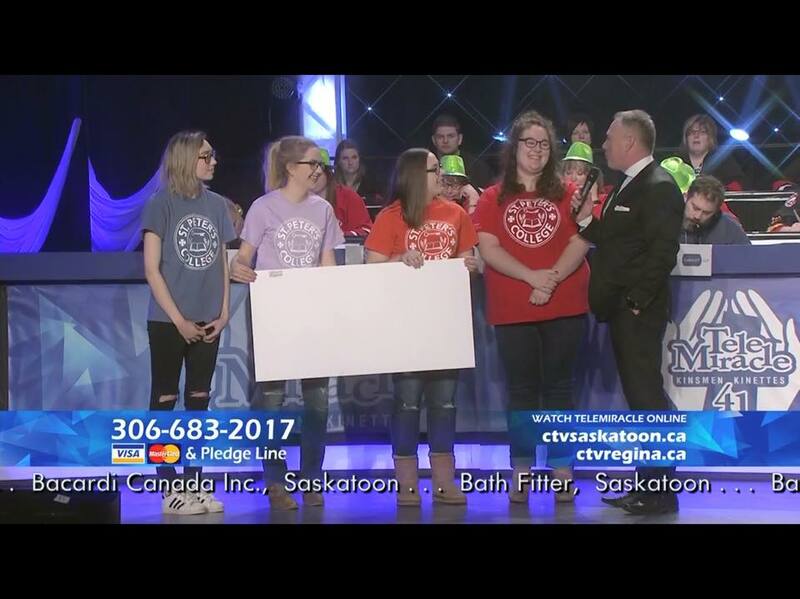 The Student Government of St. Peter’s College raised a grand total of $1,300 to donate to Telemiracle, helping make a positive impact in the lives of Saskatchewan residents. The Student Government was able to accomplish this by holding a number of different fundraisers, which included weekly pancake, pizza, and taco lunches. They also held a couple of BYOBs, where students could bring their own banana and we supplied ice cream and a number of delicious toppings for banana splits. Our student government hosted two dances where a portion of the proceeds went to Telemiracle. One of the dances was a Halloween themed dance held in October, and the other dance was an 80’s themed dance, which was held in February. Individuals attending the dance could purchase their tickets a discounted price if they donated a non-perishable food item. These dances allowed us to donate over 500 non-perishable food items to the food bank in Humboldt. The last thing the Student Government did to support Telemiracle was selling helping hands throughout the college. With the help of the students and staff of St. Peter’s College we were able to donate $1300 to a great cause.